that dominated UK music in around 1992 before it was cruelly anihilated by Grunge. 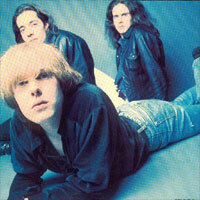 A definate one for our website then, are Revolver, who were (in a word) ACE. Being on Hut, there's little background available in the records (Hut being a subsiduary of Virgin, the album sleeves contained little in the way of notes), so all I've got about them is that Mat Flint played bass after Revolver on several tracks of Death In Vegas 'Dead Elvis' album in 1997. Live Review, MM July 1992: "If Revolver ever outgrow their fear of noise, they could be legendary." Reading Festival review: MM "... quick, call the taste police ..."
Live Review, November 1991, MM: "Revolver are better than Blur. There´s really not a fat lot else to say about them right now." Cold Water Flat Review, May 1993, MM: "The desired perfect pop effect is miraculously achieved." name Hot Rod with the title Speed, Danger, Death. Smashing Pumpkins, Moose, and Verve. The haircut gives the game away as surely as the band name. Revolver are precocious '60s pillagers, rifling through the past in the hope of creating something worthwhile for the future. It's an old scam that doesn't always work. While Spitfire manage to pull it off with a heady live show, flushed with cocky verve and raging tunes, Revolver find themselves shooting blanks over and over. The guitars are cranked up to tinnitus-inducing levels, the drums are never short of thunderous and Mat Flint's voice has developed a depth that was missing from their earlier vinyl excursions, but this is sadly neutered by a staid and dreary stage performance. He may have an ace '60s name and a smart red shirt, but Flint is not exactly over-endowed in the charisma department. So it's left to the songs themselves to grab the attention. 'Venice', the current single, is terrific. Flint's vocals meshing easily with his swirling guitar and Hamish Brown's tense bass. 'Drowning Inside' and 'Red All Over' are similarly successful, both tethered comfortably in melody meadow. But these high-points are surrounded by acres of dull, listless tunes that are as gripping as "Songs of Praise". Revolver are capable of making exciting, vital music - the new single proves that - but tonight's performance rarely rises above perfunctory, when really, nothing less than exhilarating is permissible. This is one Revolver that's from from 'Loaded'.